It’s becoming clear that the only sensible solution to the crisis in the Gulf is to teach fish to eat and enjoy crude oil. Really, can it be more difficult than teaching a 4 year old to eat vegetables? I respect and admire the vegan mindset and could probably go without juicy red meat for long stretches and when I was sure no one was looking. But I’d perish without seafood. And probably so will the rest of us in the year 2050, according to a new study released today by the United Nations. They said overfishing is on-track to deplete the oceans of fish within forty years. My wife and many other people I know are just fine with that. They could take or leave seafood and they hate going in the ocean because of what lurks beneath the surface. And a fishless ocean, I concede, is not without its appeal. It gives even a seafood lover like me the creeps to be standing in the surf and feel something slimy brush up against my leg. Blame Steven Spielberg. 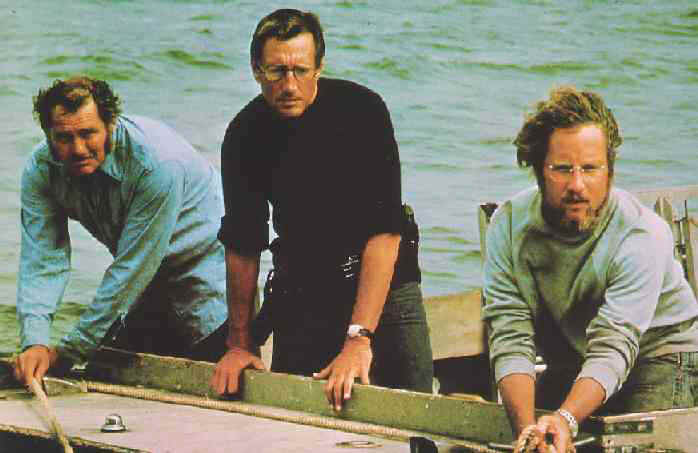 His 1975 classic, “Jaws” remains one of the scariest movies of all time. And a great buddy movie, too. I stop whatever I’m doing any time I happen upon the scene where Quint, Chief Brody and Hooper are getting drunk and swapping stories about their scars. I respect all God’s creations, but if someone said we were going to get rid of all the sharks I’d be hard pressed to come up with an opposing argument. They’re dangerous and contribute nothing useful to the planet. Same goes for things like mosquitos and Ashton Kutcher. Every time I read news that a shark has eaten a hapless swimmer or chomped a limb off some surfer dude, I always go to the seafood counter at my local grocer and order a pound of shark meat for lunch on the grill. I figure it’s the least I can do. I put some seasoning on it, maybe a little butter, flip it after four minutes over the glowing coals, repeat. Then I say a little grace and take a bite. The thing is, shark isn’t even that tasty. Neither, I suppose, is unseasoned surfer dude. It’s not like that with lobsters, Neptune’s most heavenly offering. I steam one at home whenever my wife takes my daughters away. I don’t like to hear the girls shriek about my inhumanity when I plunge live lobster into the steaming brine. It distracts from my ability to hear the doomed lobster shriek. Kidding! I don’t like the act of it either, but if any of us were at all ethical about food consumption then none of us would, as Lisa Simpson advises, ever eat anything that casts a shadow. I’ve been conditioned by culture and security measures at my local grocer to think dining on lobster is the epitome of class. It’s served at only the finest restaurants and is the only item in my entire grocery store that is under 24-hour lockdown. It’s true. Whenever I order a lobster, the guy in the seafood department has to go fetch a set of keys and unfasten two fist-sized locks bolted to a metal bar securing the tank. I understand their potential value, but I can’t image surging levels of desperation and sophistication so unrestrained that anyone would be moved to shove a live lobster down his or her pants. I’ve wondered if maybe I had it backwards. Maybe it wasn’t to keep thieves out, but to keep crafty crustaceans in. Nah, can’t be. I’ve been to lobster-rich Maine many times and I’ve never seen loose lobsters on the lam -- and wouldn’t that make for a dandy surf ‘n’ turf! For all it’s succulence, lobster isn’t one of the healthiest seafoods, certainly not like salmon, mackerel or sardines. These are among the fish that are described as “oily” and provide us with a rich source of omega 3 polyunsaturated fatty acids which help reduce the risks of heart disease. Amazingly, food described with words like polyunsaturated, fatty and acid is actually healthy. And that brings me back to teaching fish about the benefits of consuming all the oil that is right now threatening to kill them. Gulf fish supercharged on pure oil has the potential to be the healthiest fish ever produced. Chris, We continue to enjoy your writing. Keep up the good work! Yes, this oil situation in the Gulf is sickening. "Sharks play an important role in the ocean food chain. If sharks decline to seriously low numbers, commercial fisheries could be threatened. In Australia, one lobster fishery is threatened, because the declining number of sharks cannot control the lobster eating octopuses." Bob! How great to hear from you! Of my 50 favorite people on the planet about a dozen of them are named Armington -- and you're included. Thanks so much for reading -- make sure the rest of the gang is, too, please. And thanks for the info about the sharks. It's very interesting, but we don't need octopi either so my point on shark elimination stands. “……lobster eating octopuses." are no good for…..”Neptune’s most heavenly offering”? Thus, we need sharks!